I know it has been FOREVER.....but it was quite a summer. For those of you who follow my Facebook page, you already know all about the "toe" incident. 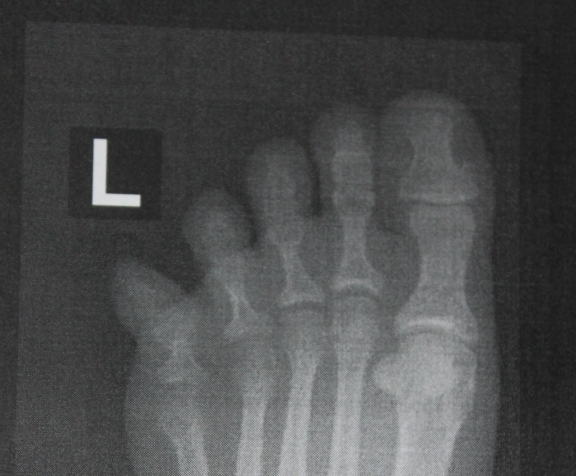 If for some reason you missed it, I broke my left baby toe on July 17th. Now, I know what you are thinking...a broken toe? Well, that's not that big of a deal, but apparently I have a talent for these things! We were getting ready for bed and I was racing around in my usual reckless fashion in the bathroom when I hit my toe on the corner baseboard. It hurt, but not unlike the thousand other times I have hit my toes on something. There was one difference though, the audible snap that both my husband and I heard. I couldn't believe it when I looked down and saw that my poor toe was sticking out SIDEWAYS from the rest of my toe/foot. "This can't be good", I thought to myself! It immediately began to swell, but didn't bruise all that much. We couldn't decide if I had broken or dislocated it. I decided to ice it, take some Advil, go on to bed, and find a doc in the morning. The next day, I scheduled an appointment with an orthopedist. I was able to walk without too much trouble (with flipflops) and everyone who laid eyes on the toe were horrified! The x-ray confirmed that it was indeed broken, and badly. I was fully prepared that he would just tape it up and tell me to deal with it, but that wasn't good enough. Being someone that has been lucky to never have had a stitch much less surgery, I was not prepared for him to tell me that he needed to put a pin into the toe to shish kabob the bones back together! What? My mind was racing as I realized that my reckless move the night before was going to require SURGERY! 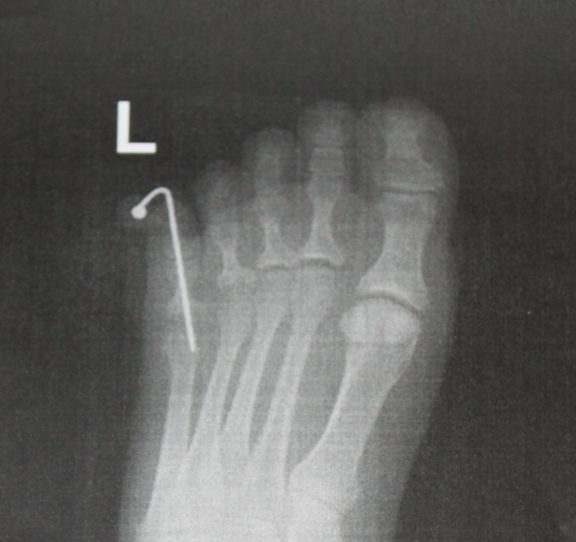 So, the next day he straightened out my poor toe and I was sent home in a splint with a pin sticking out of the end of it! I know it sounds terribly painful, but it wasn't anything that some Tylenol or Advil couldn't handle. I was told NOT to put weight on it and went home on crutches (double yuck on that). If you or a loved one ever find yourselves on the dreaded crutches, do yourself a favor and purchase some cool covers over at crutcheze. These are padded with high density foam and make life so much more comfortable. I also purchased the little bag that is held on with velcro to carry a water bottle or insulated cup. These items were life savers for me! After a couple of weeks, I went back and the doc put on a cast so that I would be a bit more mobile. The splint did not offer a lot of protection for my crazy hopping around since it was all soft bandaging. I know it sounds crazy, but the cast was a LOT better than that silly splint. 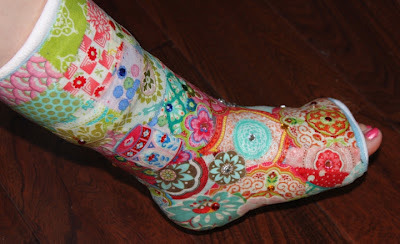 For one thing, it was shorter, which meant that I could bend my leg a lot better, and it also meant that I could decorate it! I went nuts with fabric scraps, mod podge, and some bling. It was the snazziest cast, ever. My doc even took a photo of the cast and said that he had never seen anything like it before. I highly recommend this if you ever have to have a cast. It does wonders to lift your spirits! In the meantime, I began thinking about how on earth I was going to work on the fall line in this condition. It was major just to get across a room and I can tell you that I got super good at hopping, not to mention manuvering crutches around. We did a bit of creative rearranging in the studio so that the iron/ironing board would be closer and I would not have to hop around as much. Hopping is exhausting! I was in the cast for FOUR LONG WEEKS! Two weeks into the cast phase, he pulled out the pin in the office. It didn't hurt, but it felt REALLY WEIRD....let's just leave it at that! For the entire six weeks, I was not allowed to put any weight on that leg. My doc was afraid that the bones would break again and the last thing I wanted was MORE surgery. I was a good girl and managed to make it through that time. The weekend before Labor Day, the cast came off and I walked out of the doctor's office carrying the crutches! What a feeling!! My foot and leg were super sore from six weeks of non use, but it gradually got better day by day. I was fortunate that I did not have to wear a silly walking boot. Four weeks post cast, I am now running around without any trouble again and I can say that after all of this, I have learned that walking is a wonderful thing. It is certainly an activity that I will not take for granted, ever again. I learned some lessons in patience and to let some things go, even if it seemed like it would kill me. Overall, it was a valuable experience. I don't recommend it, but I think every experience we have in our lives is for a reason. Needless to say, I watch where I am going a bit more these days. The best news of all is that the fall line is finished and at the printer now! I will be blogging about it next week with teaser photos of the designs. I think that my adventure through "Toe Land" did influence my designs in a couple of ways (in unexpected good ways). But I'll go into detail on all that next week as applicable. So, there's my summer in a not-so-small nutshell. I trust that yours was much less dramatic and that you have had lots of time to sew.